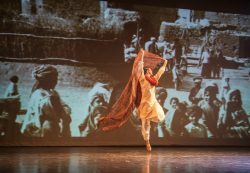 ONE of the most unusual events to mark the centenary is at Bourne­mouth’s Pavilion Dance at 4pm on Sunday 11th November, when Ak­a­demi performs The Troth, set in Punjab and the Belgian trenches. Music and words play a big part in the commemorations, which start on Saturday 3rd November among the contemporary vehicles at Bovington Tank Museum with Questa Voce and Questa Musica, performing Karl Jenkins’ The Armed Man (a Mass for Peace) and other favourites. Also on Saturday 3rd and in a military setting, St John’s Singers from Salisbury are joined by reader John Pitt-Brooke for WWI Songs and Reflective music at the Museum of Army Flying at Middle Wallop. On Sunday 4th November, Brid­port Arts Centre has a community concert, Light to the Darkness, with wartime songs. At Salisbury City Hall, We Will Remember Them starts at 3pm. and at Warminster Athenaeum In Flanders Fields commemorates the war in words and music, There is also a Festival of Remembrance at Weymouth Pavilion. On Monday 5th November Antic Disposition begins three nights of performances of a new version of Henry V with poems by AE Hous­man, performed by a cast of actors from the UK and France at Salisbury Cathedral, which has also arranged various BBC archive screenings throughout the month of November in the cloister. Michael Morpurgo’s Private Peaceful, the story of a boy soldier executed for disobeying an order at the Front, starts a week-long run at Bath Mission Theatre on Tuesday 6th November. On the same day, Taunton Thespians begin their production of Joan Littlewood’s brilliantly funny and harrowing anti-war musical Oh! What a Lovely War at the Brewhouse. It has an extra performance on Sunday 11th at 4pm. Troubadour duo GreenMatthews come to Dorchester Corn Exchange on Wed­­­nesday 7th November with The Men Who Marched Away, Songs of the Great War. On Thursday 8th November Brid­port Arts Centre has two events, When Tommy Came Marching Home (readings, poems, songs and reflections) at 11.30am and a screen­ing of the film of Oh! What a Lovely War in the evening. The short tour of Meet Tommy Atkins with Peter Gill is at Broad­oak Village Hall on Thursday 8th and The Pound at Corsham on Friday 9th, returning to Yetminster Village Hall on 16th November. Gilling­ham Arts Workshop performs Only Remembered, The First World War in Words and Music, at the Library on Friday 9th November, and the Marine Theatre in Lyme Regis shows the film of Michael Morpurgo’s War Horse, set in Devon and in the trenches. The Wimborne-based State of Play gives two performances of its evocative history of the effects of the war on a Dorset community, The Gathering – Messages from the Great War, at Marnhull Village Hall on Friday 9th and at Briants­puddle on Sunday 11th November. Also on 9th November, the new film of RC Sherriff’s Journey’s End will be shown at Nunney village hall and the Nadder Centre in Tisbury. The Phoenix Singers have a Lest We Forget concert at the parish church at Bishop’s Lydeard on Saturday 10th November, a day when concerts include the Bristol Ensemble and Bath Camerata performing Eternal Light at St George’s in Bristol, Exeter Phil­harmonic Choir in Bruckner’s Mass in Em and Rutter’s Requiem at Exeter Cathedral, Salis­bury Musical Society, Chelsea Opera Group Orchestra and the cathedral choir singing Britten’s War Requiem at Salisbury Cathedral, Sherborne Chamber Choir’s Rem­em­brance in Words and Music at Sherborne Abbey and at Wells Cathedral the Oratorio Society performs a Concert for Remembrance 1918-2018. At Sturminster Newton, local company Taboo give two performances of Rage, Tears and Cider, a new play about life in wartime Sturmin­ster. Services and acts of commemoration are arranged in most communities on Remembrance Sunday 11th November. This year they are supplemented by a performance of Bach’s St Matthew Passion at Wiltshire Music Centre, in Bradford on Avon, The Sitkovetsky Piano Trio playing Stravinsky’s A Soldier’s Tale and Messiaen’s Quartet for the End of Time at St George’s in Bristol and the BSO and chorus at Poole’s Lighthouse performing Always Remembered – Sol­diers’ Songs, World War I poems and letters from Dorset soldiers. Avebury is one of the sites for the Beacons of Light, 1,000 which will be lit at 7pm on 11th November across the country. The events stars with prayers, words and music at St James’s Church at 6pm, followed by a procession to the beacon site on Waden Hill, overlooking Silbury Hill. As part of the annual Bath Mozartfest, Juliet Stevenson joins Bath Camerata at St Mary”s in Bathwick for a late afternoon concert of words and music, They are at Rest. At St Thomas’s Church in Salis­bury, the Eucharist includes a performance of Faure’s Requiem and at Southampton’s Mayflower, there is a Royal British Legion Festival of Remembrance with choirs, song, drums, orchestra, music and poetry. At the Rex Cinema in Wareham, which opened two years after end of the war, the 1916 film Battle of the Somme will be screened. Wells Cathedral has a performance of Rutter’s Requiem and war poetry at 3pm. And Yeovil Octagon welcomes actor Timothy West and the Armonico Consort for They Shall Not Grow Old, a programme of music by Allegri, Elgar, Barber, Byrd and Guest interspersed with readings. For more details, contact the venues. Posted in Miscellany on 2 November, 2018 .